Crostini the Italian word for “croutons,” which refers to any toast breads. They can be medium or large slices, plain or garnished. They are not the miniature bread cubes that garnish green salads and bowls of soup. 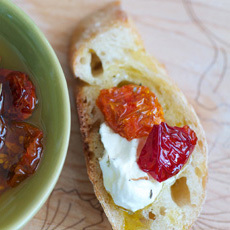 Instead, medium or large crostini, plain or garnished, would be served with the salad or soup. 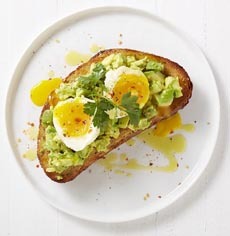 Crostini are a scrumptious breakfast choice, too. 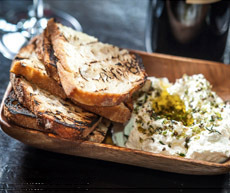 We especially like DIY crostini, where we put out toasted bread along with bowls of toppings, and let each person construct his or her own. First, plan your toppings from the list below, or add your own. Next, get the best bread you can find. We like thick slices of a crusty rustic sourdough loaf for breakfast crostini. It makes a nicely crunchy toast. Remember that this is a do-it-yourself recipe, so you can serve sweet ingredients (fresh cheeses, fruits and honey, for example), savory ingredients (bacon, eggs, hummus, sautéed spinach), or some of each. Breakfast spreads: avocado, hummus, spreadable cheese, yogurt, etc. 1. SET OUT the toppings. 2. TOAST the bread; cook the eggs and breakfast meats. That’s it! Photo credits: Top, Fig & Olive restaurant. Second, Safest Choice Eggs. Third: Mixed Greens Blog. Bottom: Locanda Verde Restaurant. 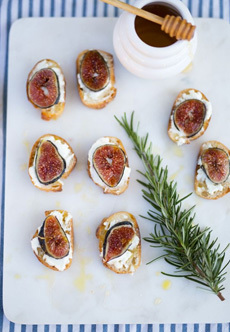 Top: Fresh figs, goat cheese and a drizzle of honey. Second: Mashed avocado and boiled egg with a drizzle of EVOO. Third: Ricotta topped with sundried tomatoes marinated in olive oil and herbs. Bottom: Serve plates of toast and ricotta, and let people top their own.